In an agreement signed yesterday 29 September 2011, Danish-based BPT Asset Management A/S (BPT) has entered into a strategic partnership with Finnish-based Evli Bank Plc. (Evli). The partnership will expand BPT’s real estate investment platform to encompass the Baltic Sea. The new partnership means BPT/Evli will become the third largest real estate asset manager in the region in terms of assets under management. The combined real estate assets under management in the new partnership total approximately EUR 1.5 billion and are located across Finland, the Baltics, Russia, Poland and Northern Germany. They cover primarily office, retail, logistics and health care assets. As part of the transaction, BPT will take over Evli’s current real estate business, Evli Property Investment (EPI) including management of its three real estate funds. Evli will in return become a major shareholder in BPT Asset Management A/S. The existing EPI team based in Helsinki, Finland will become part of BPT and EPI’s current Managing Director Petteri Nurminen will enter into BPT’s executive group. In addition, Evli Bank’s CEO Maunu Lehtimäki and Forbia Oy’s CEO Petri Olkinuora will be appointed as Evli’s representatives on BPT’s Board of Directors. BPT founder Lars Ohnemus will remain as Chairman of the Board and Mikael Hyttel Runegaard Thomsen will remain as CEO of BPT Asset Management A/S. BPT will as part of the transaction look to separate its internal asset and property management functions in order to create an even stronger focus on value creation in both areas. The expanded geographic scope of operations combined with the extended real estate asset and property management expertise means BPT will have a uniquely strong platform from which to service investors on an international level going forward. Nordic and Baltic region, ranging from mature markets like Finland and Northern Germany to emerging markets like Russia and the Baltic States. The asset management team alone will consist of more than 30 senior real estate professionals from more than 10 different nationalities all focused on creating value for our investors,” says Chairman of the Board and founder of BPT Lars Ohnemus. – “This transaction strengthens Evli’s position within real estate asset management in the Nordic countries. Through the transaction we can offer our clients new resources and the long time experience BPT has in investing in real estate. The position and expertise of the new combined team will help attracting more international investors into the funds,” states Evli’s CEO Maunu Lehtimäki. offices in Berlin, Warsaw, Vilnius, Riga, Tallinn and Moscow. The company has approximately 100 employees. BPT is a member of INREV and SIPA. Visit us at www.bptam.com. Evli Property Investments Ltd has been a fully-owned subsidiary of Evli Bank Plc. The main function of Evli Property Investments Ltd is to manage, develop and innovate Evli’s real estate fund business. EPI established the first Finnish real estate fund in April 2005. The company manages a total of three property funds totaling EUR 400 million in assets under management. 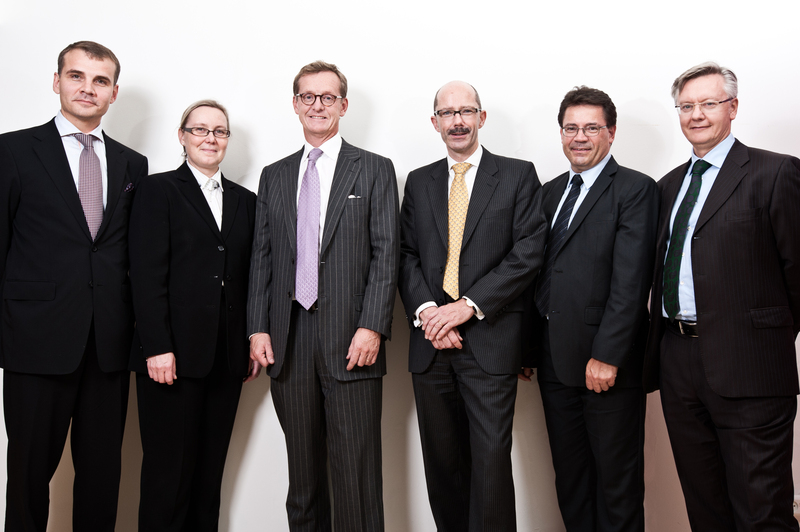 from left to right: Maunu Lehtimäki CEO Evli Bank Plc., Johanna Lamminen CFO Evli Bank Plc., Henrik Andersin Chairman of the Board Evli Bank Plc., Lars Ohnemus Chairman of the Board BPT Asset Management A/S, Mikael Thomsen CEO BPT Asset Management A/S, Algis Vaitiekunas Partner BPT Asset Management A/S.